One of the most important decisions a company faces is how to price its products and services (hereafter referred to as product). What is the relationship between price and demand? 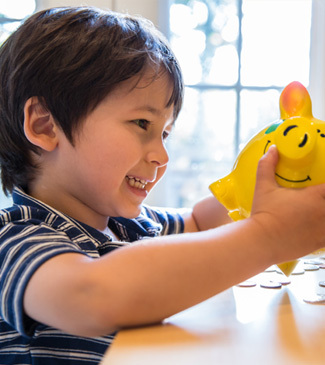 What price point will maximize profits? What price point will maximize sales volume? Who are the product’s customers at various price points? Which customers are lost if the price is increased? Which product features and characteristics are most important to consumers? What is the dollar value for each product attribute? What combination of product attributes maximizes both demand and price? What combination of product attributes can best compete in the marketplace? As indicated above, the main objective of any pricing study is to understand the relationship between price and demand. On the right is a typical Price-Demand relationship. 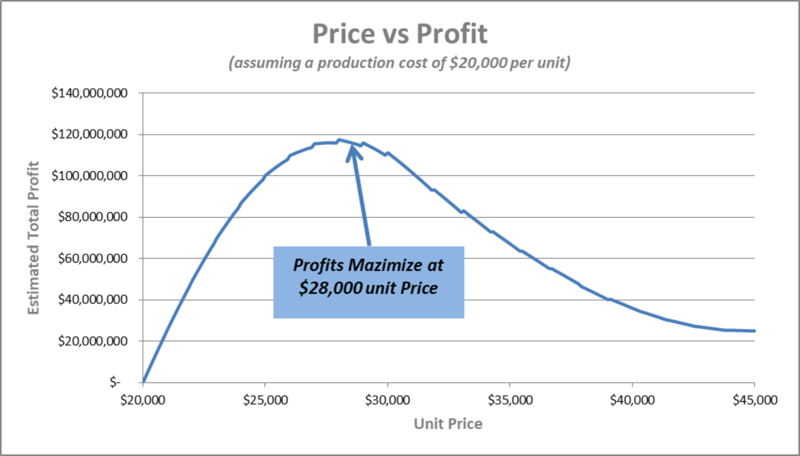 Note: In this example, cost of production per unit is independent of units sold. However, normally the unit cost of production drops as the number of units produced grows. This can be implemented in the analysis. 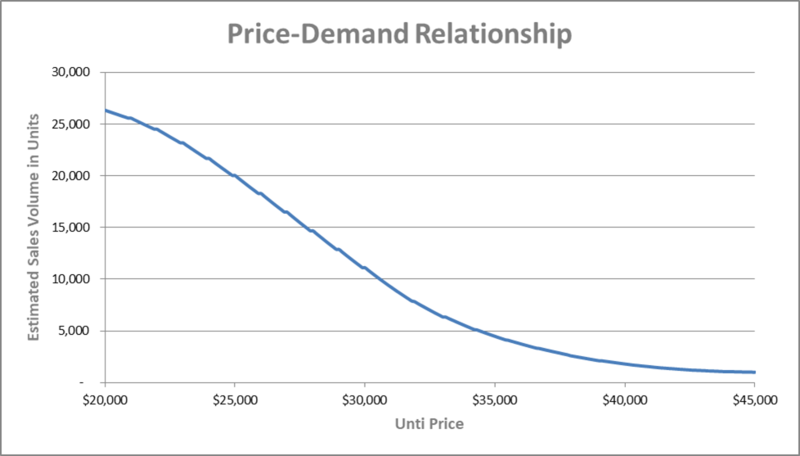 This is the simplest approach to determine the price-demand relationship. In this technique multiple respondents are asked: “What is the highest price you are willing to pay for the following product…?” When the results of this question are analyzed across all respondents, a demand curve can be produced for the entire market, as well as key segments of the market. In determining the demand curve, we assume that a consumer will purchase, let’s say an automobile, at any price point at or below their highest acceptable price. The main advantage of this technique is simplicity. However, key disadvantages are: (a) respondents tend to be conservative in stating the highest price they are willing to pay for a product, and (b) doesn’t account for specific product characteristics. Since respondents often overstate their price sensitivity, it is often best to determine their true price sensitivity indirectly. To do this, we first determine a set of price levels that we wish to test. Next, we describe the product in more detail to respondents. We then randomly choose a price point, from the set of prices we would like to test, and ask the respondent to indicate their willingness to purchase the product at that given price. This can be done through a 5-point scale or simply Yes-No questions. If the respondent is willing to purchase the product at the given price point, we will repeat the question at a higher price point. This continues until the highest price in the set of price levels is tested. At any time, if the respondent is not willing to purchase the product at a given price, we repeat the question with a lower price point. This continues until the lowest price in the set of price levels is tested or until the respondent is willing to purchase the product at a given price point. This technique is simply illustrated below. As shown above, the highest acceptable price can be determined from a series of indirect questions and a demand curve can be created from the accumulation of responses. The main advantage of Indirect Pricing Technique is that it is simple to administer and very easy for respondents to answer. Its key disadvantages are that (a) the range of acceptable prices must be known and limited, and (b) results tend to overstate the highest price point at which consumers would actually go through with their purchase. Point of Marginal Cheapness (PMC) – Where “too cheap” meets “getting expensive”. That is, equal proportion of consumers feel the product is “too cheap” and “too expensive”. Products should not be priced below this point. Prices below this point do not significantly increase market share. Point of Marginal Expensiveness (PME) – Where “bargain” meets “too expensive”. To reach the maximum market possible, products should not be priced above this point; if they are, it will be a significant trade-off between price and market size. Optimum Price Point (OPP) – Where “too cheap” meets “too expensive”. This is often the recommended price. Indifference Price Point (IPP) – Where “bargain” meets “getting expensive”. This generally represents either the median price actually paid by consumers or the price of the product of an important market leader. 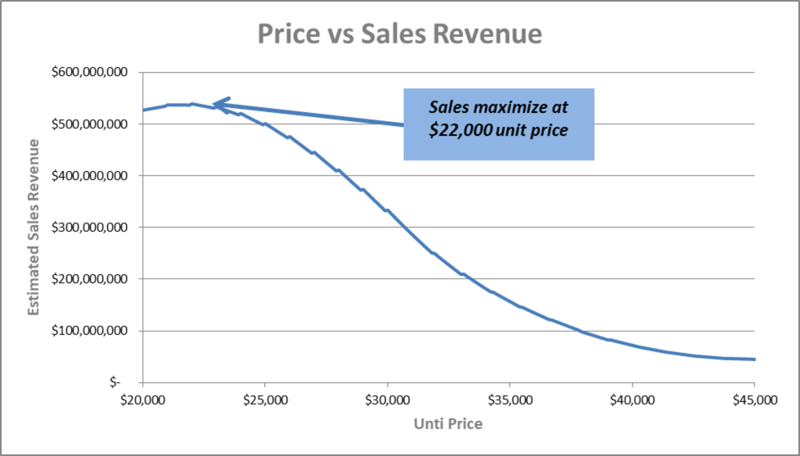 In the example chart above, we should price the product between $16,000 and $25,500. The optimum price is $20,500. The indifference price is $22,000. 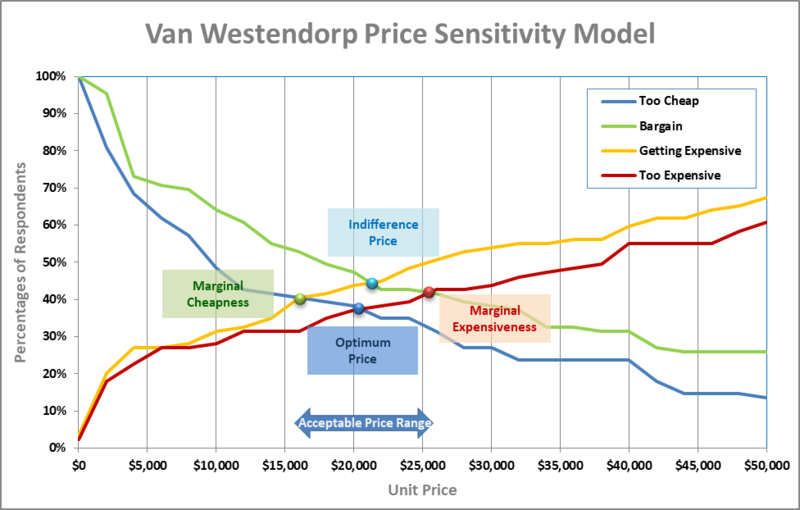 Although Van Westendorp pricing model is slightly more complex to analyse, its key advantages are that the questions are very easy for potential consumers to answer. Furthermore, the model puts no restriction on price levels. The main disadvantage of this pricing technique is that it does not permit modifying product attributes to gain market share or accommodate higher price points. As such Van Westendorp is most suitable where the products are fully developed and unchangeable. Frequently, a pricing question is tied to a product question. That is, what features would result in the highest acceptable price, the greatest market share, or the best profits? For this reason, the ideal pricing technique in past few decades has been Product-Price Mix Techniques such as Discrete Choice Modeling (DCM). Typically, a respondent will see 10 to 15 different sets of products and each time is asked to indicate which product, if either, they would purchase. The results generated from a DCM are based on respondents’ choices rather than stated opinions. As such, DCM results reflect the “real world” marketplace with competing products and consumers having to make a “choice”. Additionally, since respondents are asked to make discrete choices, there is little opportunity to consciously monitor or censor responses across multiple-choice scenarios. The data generated by this exercise are used to develop a Discrete Choice Model. This model works by identifying patterns in consumer behavior across all respondents and all their choices. distribution and availability of the product and promotions. The data generated by the Discrete Choice Model can then be used to build an interactive Discrete Choice Simulation tool. This DCM Simulator allows users –i.e., clients—to test any number of market scenarios. This is similar to having all of the survey participants in your own private “panel” to get their opinion repeatedly, at any time, about the prices they are willing to pay for different product feature combinations. The derived importance of each product attribute – for instance, what is the relative importance of Brand, Price, Horsepower, Fuel Efficiency, or even Styling, in consumers’ choice of one vehicle over another. And the derived importance values can be calculated for any subsegment of the market, like for example “Millennials”. The relative preference for each product feature – with regards to a vehicle’s make, what is the relative preference for Toyota, Honda, Chevrolet, Ford, etc? With regards to “fuel economy”, what is the relative preference for 35 MPG vs. 40 MPG, etc.? 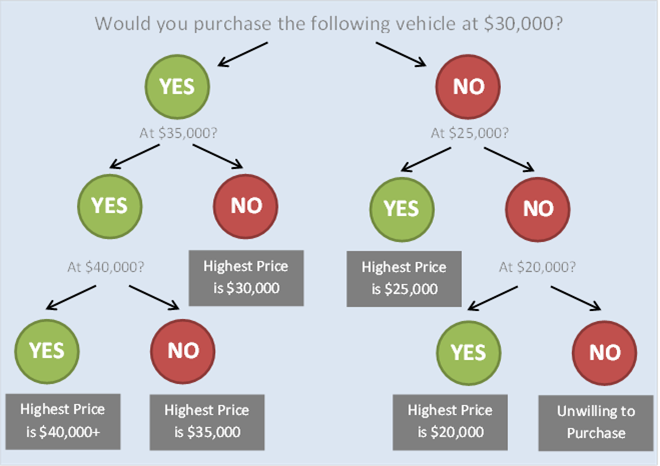 With regards to price, what is the relative preference for $25,000 vs. $30,000? Similarly to derived importance, relative preference can also be calculated at any segment level. 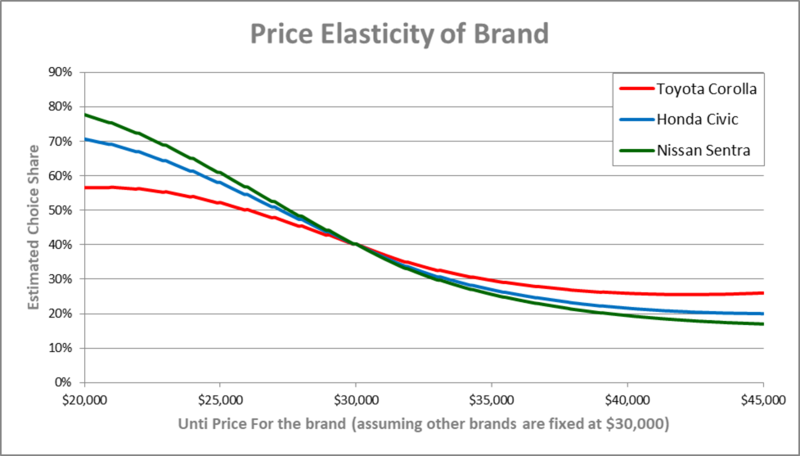 Price elasticity model – a price elasticity model can be developed to show the price point for various products that will result in the best outcome in a competitive marketplace. The model can be created for different factors (e.g. brand, HP, fuel economy, etc.). This chart shows some hypothetical data with respect to three competing vehicles. The pricing model can also be presented in terms of differential pricing. In this chart, VW Jetta and Nissan Sentra (with the same features) are tested, but with Jetta pricing varying with respect to Sentra. 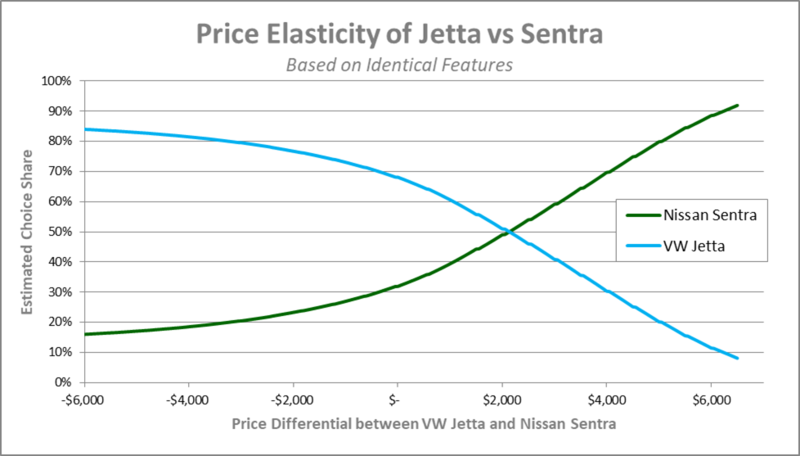 As can be seen by this hypothetical example, Jetta and Sentra will have the same market share if Jetta is priced $2,000 above Sentra. In essence, this is Jetta’s brand equity vs. Sentra. The condition of being transparent.